I have had three guide dogs from Guiding Eyes for the Blind, dogs that have saved my life, and yes, they’ve made every minute joyful. I used to go to work without songs. I’m sure you know the feeling. As you open the door to your office you’re thinking of Microsoft Outlook and it’s relentless calendar. But with my guide dog by my side the drear world is altered. There’s joy inside every animal–even the tarantula loves secret corners of the night–but guide dogs love all the minutes, morning and evening, and my dogs also adore silly songs. Honest to God, we go to work like the 7 Dwarves, dog and man, giddy for whole moments. There’s a bone on the floor, just where we left it. We have a little aria, us two. We will turn on Outlook, but not until we’ve honored the bone. My current guide, “Nira” is companionable– she loves her people. All day she exults in the presence of the staff in my office, and lucky for her, we work with college students, so her pack is wide. Her joy is reflected in the faces of students and faculty all day long. We stick to the rules: when she’s wearing her harness she’s working and not to be petted. But then we have silly dog time and you better believe that Nira’s people are ready. And what this reminds us is that good work requires unambiguous play, both for dogs and the two leggeds. 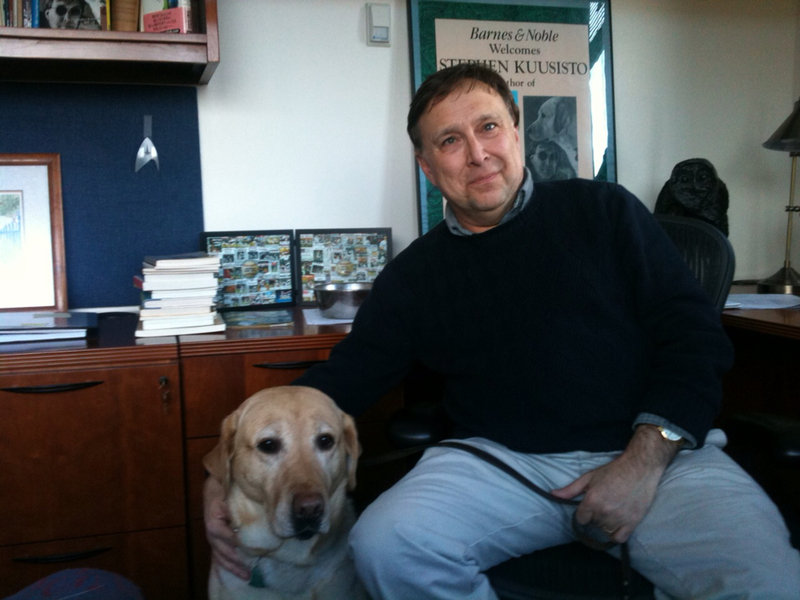 The photo above shows Nira and I looking mutually pleased in my office at Syracuse University. We get plenty of work done. But not without the songs. “but not until we’ve honoured the bone.” Wonderful post! And a really good reminder that silly dog time is a necessary part of the day. This makes me miss my black lab – not a service dog, but a sweet-hearted, wonderful girl nonetheless. Nira’s got the same look in her eyes that Sasha always had. It sounds great to be able to bring your dog with you everywhere you go. I am a lover of all things “dog.” I am in awe of service dogs and how wise and sensible they are. What a friend we have in dogs. I loved reading about Nira.